Versatile: plywood is good for model making as well as some types of furniture. Image by Andriy_A (via Shutterstock). 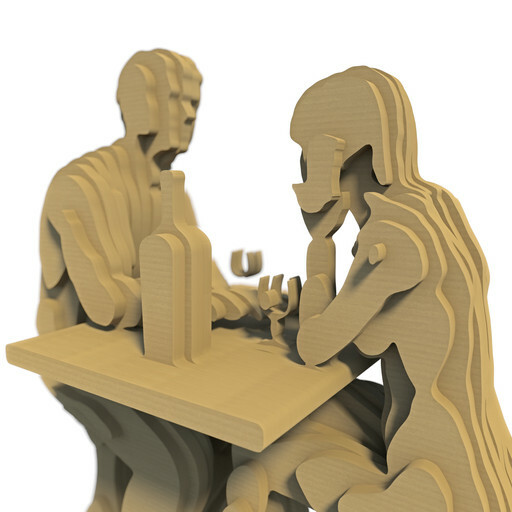 Make no bones about it: plywood is a versatile kind of wood suitable for model makers as well as interior designers. For several years, it has been a popular material for toy makers and light decorative touches around the house. Inspired by this, we have a selection of plywood project ideas. The Instructables is an awesome website for crafters, and plywood is well represented on this site too. We especially like the project ideas curated by one user, Sam DeRose. One example is this plywood children’s chair. With its round edges, it has modernist leanings and could have easily fitted in within an Art Deco house. Also good is Wholman’s four square chair. There’s even project ideas to build boats and rafts with plywood. We at Theo’s Timber love the novel ideas, but the River Irk (close to our premises) shouldn’t be your first port of call for testing a plywood dinghy. Oh, and it’s pretty grim as the Irk goes underneath Manchester Victoria station, prior to joining the River Irwell. Another good source for projects is the Popular Mechanics website. Last year, they created a roundup entitled 15 Cool Projects You Can Make From a Single Sheet of Plywood. All of the fifteen projects in this piece used a single 4’ x 8’ sheet of plywood. The Eames style chair is a wonder to behold, as is the plywood dog kennel. Check out the plywood boat. This website does exactly what it says on the tin. There is a number of wooden toy plans, most of which are free to download. Some are available for a modest price and are more complex. There are plenty of toy trains and garages for you to build and plywood is the obvious choice. Dolls houses are well represented, too. If you was at a loose end, we hope all of the above project ideas have got you fired up with enthusiasm. For more details on the plywood we offer, call us on 0161 834 6789. We will be happy to get you started. Theo’s Timber, 05 May 2017.